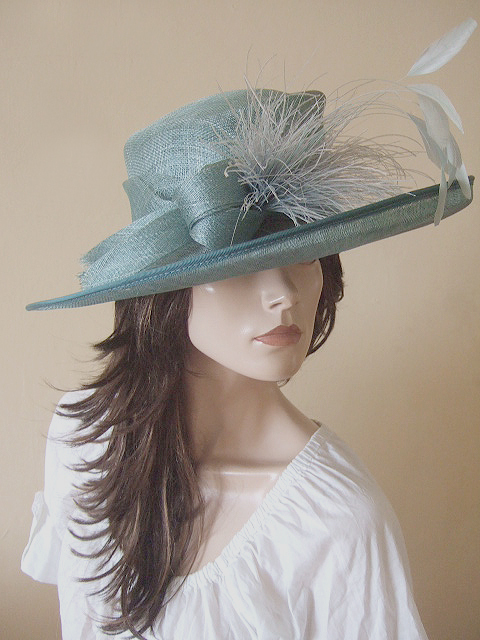 This is a Greyed Jade Wide Brim Hat from Presen Barcelona, slightly sloping brim and medium height crown, dressed in sinamay swirls the same colour as the hat, and slightly lighter ostrich hurl. Works well with Sea Breeze Tones or Jades..
Crown has a 22.5" inside circumference. Bmim 4.75" Wide at left upside, 4.5" at the right, downslope.